The Devereux Center for Resilient Children’s (DCRC’s) approach to fostering resilience in infants and toddlers is a comprehensive assessment and planning process that involves families and professionals working as partners. The significant adults in a child’s life work together to collect information, including social and emotional screening and assessment data, and use the information to develop plans that promote children’s social and emotional skills and resilience. Families, educators, consultants and other significant adult caregivers continuously monitor, evaluate, and modify the plans as needed, ensuring positive outcomes are achieved for all children. … as well as strategy guides for families, teachers, home visitors, and other adults involved in the lives of children to promote their healthy social and emotional development and resilience. 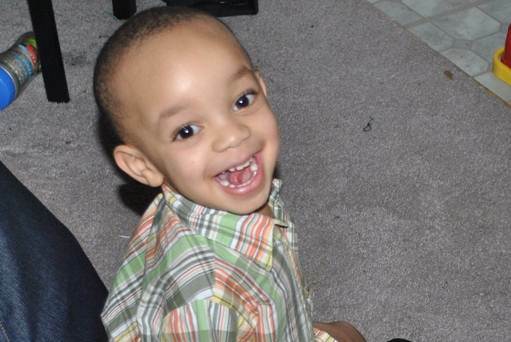 We also conduct research and advocate on behalf of children, families and child-serving professionals. DCRC provides professional development to help families and professionals use our resources effectively. 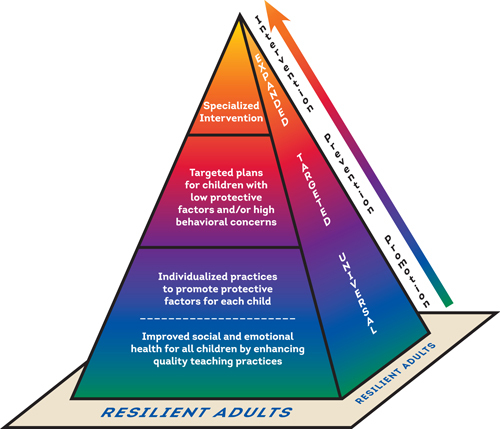 All our efforts and resources are based on resilience theory and help children and adults bounce back when faced with adversity. The central concept of our approach is “looking through social and emotional lenses”, which recognizes that social and emotional skills and resilience are best developed through everyday interactions and experiences that are done with awareness and purpose – what is often referred to as intentionality. DCRC’s strength-based approach is prevention oriented, meaning that it is designed to benefit all children and the families and adults in their lives. Because all children benefit from strong protective factors, and because a child may face increased risk at any time, DCRC emphasizes the importance of building strong protective factors for all children and adults. DCRC’s model emphasizes promotion, prevention, and intervention. We refer to the supports offered at these three levels as Universal, Targeted, and Expanded. Break a task into small steps: Sometimes a young child will be more successful and will follow directions when an adult helps the child understand and follow each step in a task. Redirection: When you see a child about to make an inappropriate choice, help them to make a more appropriate choice by redirecting them to another activity. And for those children who have already developed significant behavioral problems, DCRC recommends Expanded strategies in addition to the universal and targeted strategies. Expanded strategies involve additional professionals with specialized training and skills like social workers, counselors, and speech and language therapists. These infants and toddlers will of course also benefit from the universal and targeted strategies in place, but the services of other specially trained professionals may also be needed to fully understand and address the children’s needs. 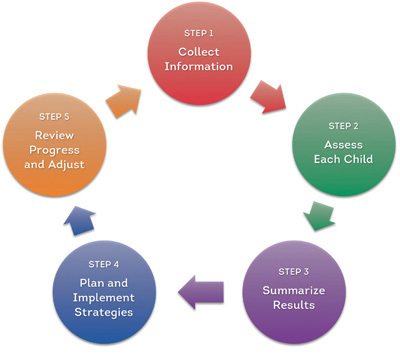 Step One: Collect Information Step Two: Assess Each Child Step Three: Summarize Results Step Four: Develop and Implement Plans Step Five: Evaluate Progress and Adjust Through these five steps, DCRC’s approach works to assess and build resilience in the young child, as well as the group setting, surrounding environment(s), and caregivers that impact young children’s lives. To implement DCRC’s approach for infants and toddlers, we provide many resources and professional development opportunities to those who support our youngest children.